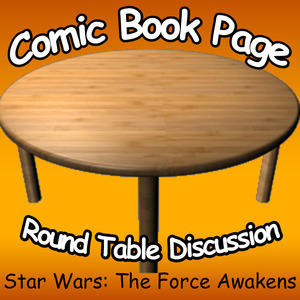 John Mayo, of ComicBookPage, and Kay Kellam, of PopArtsPlace, have a spoilers filled discussion about the latest Star Wars movie: Star Wars: Episode VII – The Force Awakens. This entry was posted in Movie, Podcast, Podcasts, PopArtsPlace, Review and tagged Adam Driver, Admiral Ackbar, Admiral Statura, Alec Guinness, Andrew Jack, Andy Serkis, Anna Brewster, Anthony Daniels, Bala-Tik, Bar Patron, Bazine Netal, Ben Solo, Brance, Brian Vernel, C-3PO, Cailey Fleming, Captain Phasma, Carrie Fisher, Chewbacca, Chewbacca Double, Colonel Datoo, Colonel Kaplan, Daisy Ridley, Daniel Craig, Domhnall Gleeson, Dr. Kalonia, Emun Elliott, Erik Bauersfeld, Ewan McGregor, Finn, FN-2187, FN-3181, FN-9330 Judah Friedlander, Force Dream, Force Jump, General Hux, General Leia, Greg Grunberg, Gwendoline Christie, Han Solo, Harriet Walter, Harrison Ford, Iko Uwais, J.J. Abrams, Jakku Villager, John Boyega, Joonas Suotamo, Ken Leung, Kenny Baker, Kipsang Rotich, Kiran Shah, Knight of Ren, Korr Sella, Kylo Ren, Lawrence Kasdan, Lead Stormtrooper, Lieutenant Mitaka, Light Saber, Lightsaber, Lor San Tekka, Luke Skywalker, Lupita Nyong'o, Maisie Richardson-Sellers, Major Ematt, Mark Hamill, Mark Stanley, Max von Sydow, May The Force Be With You, Maz Kanata, Michael Arndt, Michael Giacchino, Mike Quinn, Nien Nunb, Nigel Godrich, Obi-Wan Kenobi, Oscar Isaac, Peter Mayhew, Pip Andersen, Pip Torrens, Poe Dameron, Princess Leia, Razoo Quin-Fee, Rey, Rocky Marshall, Sasha Frost, Sebastian Armesto, Simon Pegg, Snap Wexley, Solo, Star Wars, Supreme Leader Snoke, Tasu Leech, Teedo, The Force, The Force Awakens, Tim Rose, Unkar Plutt, Warwick Davis, Wollivan, Yayan Ruhian, Young Rey on December 25, 2015 by Kay. 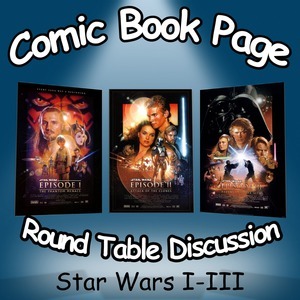 John Mayo and Kay Kellam have a spoilers filled discussion about the Star Wars prequel movies: Star Wars: Episode I – The Phantom Menace, Star Wars: Episode II – Attack of the Clones and Star Wars: Episode III – Revenge of the Sith. This entry was posted in Movie, Podcast, Podcasts, PopArtsPlace, Review and tagged #StarWars, Aayla Secura, Achk Med-Beq, Agen Kolar, Ahmed Best, Alan Ruscoe, Alethea McGrath, Amanda Lucas, Amy Allen, Anakin, Anakin Skywalker, Andy Secombe, Anthony Daniels, Anthony Phelan, Attack of the Clones, Axel Dench, Ayesha Dharker, Balance the Force, Ben Kenobi, Bene, Beru, Beru Lars, Boba Fett, Bodie 'Tihoi' Taylor, Bodie Taylor, Bonnie Maree Piesse, Bonnie Piesse, Boss Nass, Brian Blessed, Bruce Spence, C-3PO, Capt. Typho, Captain Colton, Captain Panaka, Captain Raymus Antilles, Captain Typho, Chancellor Valorum, Chewbacca, Chi Eekway, Christopher Kirby, Christopher Lee, Claudia Karvan, Cliegg Lars, Clone Trooper, Coinneach Alexander, Comic Book Page, ComicBookPage, Commander Cody, Cordé, Count Dooku, Daniel Logan, Dannl Faytonni, Dark Side, Dark Side of the Force, Darth, Darth Maul, Darth Tyranus, David Bowers, Dexter Jettster, Dooku, Dormé, Droid, Elan Sleazebaggano, Ewan McGregor, Fang Zar, Frank Oz, General Grievous, Genevieve O'Reilly, George Lucas, Giddean Danu, Governor Tarkin, Graeme Blundell, Hayden Christensen, Hayley Mooy, Hermione Bagwa, Hugh Quarshie, Ian McDiarmid, Jack Thompson, Jake Lloyd, James Rowland, Jango Fett, Jar Jar, Jar Jar Binks, Jay Laga'aia, Jedi, Jedi Master, Jeremy Bulloch, Jett Lucas, Jimmy Smits, Jobal Naberrie, Joel Edgerton, John Mayo, Julian Khazzouh, Katie Lucas, Kay Kellam, Kee Chan, Keira Knightley, Keira Knightly, Keira Wingate, Keisha Castle-Hughes, Kenji Oates, Kenny Baker, Kenobi, Ki-Adi-Mundi, Kristy Wright, Lama Su, Leeanna Walsman, Lewis Macleod, Liam Neeson, Lott Dod, Mace Windu, Madame Jocasta Nu, Malé-Dee, Mas Amedda, Matt Doran, Matt Rowan, Matt Sloan, Matthew Wood, May The Force Be With You, Michael Kingma, Mon Mothma, Moteé, Mousy McCallum, Naboo, Natalie Portman, Nee Alavar, Nute Gunray, Obi-Wan Kenobi, Oliver Ford Davies, Organa, Owen Lars, Padmé, Palpatine, Pernilla August, Peter Mayhew, Phantom Menace, Plo Koon, Pooja Naberrie, PopArtsPlace, Prophesy, Queen Amidala, Queen Jamillia, Queen of Alderaan, Queen of Naboo, Qui-Gon Jinn, R2-D2, Ray Park, Rebecca Jackson Mendoza, Rena Owen, Revenge of the Sith, Robert Cope, Rohan Nichol, Ron Falk, Rose Byrne, Ruwee Naberrie, Ryoo Naberrie, Sabé, Saché, Saesee Tiin, Samuel L. Jackson, Sandi Finlay, Sebulba, Senator Bail Organa, Senator Orn Free Taa, Senator Palpatine, Shmi Skywalker, Silas Carson, Sio Bibble, Sith, Sly Moore, Sofia Coppola, Sola Naberrie, Star Wars, Steven Foy, Supreme, Supreme Chancellor Palpatine, Susie Porter, Taun We, Temuera Morrison, Terence Stamp, Terr Taneel, The Force, Tion Medon, Trisha Noble, Tux Akindoyeni, Veronica Segura, Viceroy Nute Gunray, WA-7, Wald, Warren Owens, Warwick Davis, Watto, Wayne Pygram, Whie, Wookiee, Wookiee David Stiff, Yoda, Zam Wesell, Zett Jukassa on December 18, 2015 by Kay. 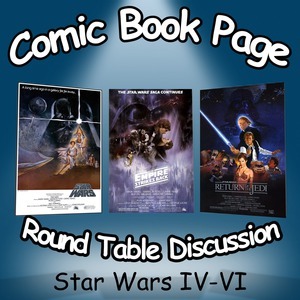 John Mayo and Kay Kellam have a spoilers filled discussion about the original Star Wars trilogy: Star Wars: Episode IV – A New Hope, Star Wars: Episode V – The Empire Strikes Back and Star Wars: Episode VI – Return of the Jedi. This entry was posted in Movie, Podcast, Podcasts, PopArtsPlace, Review and tagged Alec Guinness, Alex McCrindle, Anakin Skywalker, Anthony Daniels, Aunt Beru, Ben Obi-Wan Kenobi, Billy Dee Williams, Boba Fett, C-3PO, Carrie Fisher, Chewbacca, Chief Jawa, Darth Vader, David Prowse, Eddie Byrne, Episode XI: The Return of the Jedi, Frank Oz, General Dodonna, General Willard, George Lucas, Grand Moff Tarkin, Han Solo, Harrison Ford, Ian McDiarmid, Jack Purvis, James Earl Jones, Jawa, Jeremy Bullock, Kenny Baker, Lando Calrissian, Leia, Luke Skywalker, Mark Hamill, Mark Hammil, Obi-Wan, Obi-Wan Kenobi, Peter Cushing, Peter Mayhew, Phil Brown, Princess Leia, Princess Leia Organa, R2-D2, Sebastian Shaw, Shelagh Fraser, Star Wars, Star Wars Episode 7: The Force Awakens, Star Wars IV, Star Wars Movies, Star Wars V, Star Wars VI, Star Wars: The Force Awakens, Tarkin, The Emperor, The Empire Strikes Back, The Force, The Force Awakens, Uncle Owen, Yoda on December 17, 2015 by Kay. John Mayo, of ComicBookPage, and Kay Kellam, of PopArtsPlace, have a spoiler filled discuss about the first and only season of NBC‘s The Player, starring Philip Winchester, Wesley Snipes, Charity Wakefield, Damon Gupton & Daisy Betts. This entry was posted in Podcast, Podcasts, PopArtsPlace, Review, Television and tagged Charity Wakefield, Comic Book Page, ComicBookPage, Daisy Betts, Damon Gupton, Philip Winchester, The Player, Wesley Snipes on December 13, 2015 by Kay.